I’ve become skeptical of the unwritten rule that just because a boy and girl appear in the same feature, a romance must ensue. Rather, I want to portray a slightly different relationship, one where the two mutually inspire each other to live—if I’m able to, then perhaps I’ll be closer to portraying a true expression of love. We often think of love as being eternal, at least in its ideal form, but I wonder… Is it possible to have transitory soulmates? A connection defined by temporality? If we feel affection, we’ve been cultivated to believe that it has to culminate in something physical or has to fit some projected idea of romance. But there’s beauty in the connection itself: where you feel lonely and then you suddenly engage with a person who resonates; they’ve been asking the same questions you’ve been asking. Walter Biggins is a writer based in Atlanta, GA. 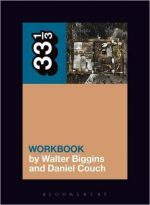 He is the co-author (with Daniel Couch) of Bob Mould's Workbook (Bloomsbury, 2017). His work has been published in The Quarterly Conversation, RogerEbert.com, Bookslut (RIP), The Comics Journal, The Baseball Chronicle, and other periodicals. Twitter: @walter_biggins.